“ … Geoffrey of Monmouth … reporteth that Brute [Brutus of Troy], lineally descended from the demi-god Aeneas, the son of Venus, daughter of Jupiter, about the year of the world 2855, and 1108 before the nativity of Christ, built this city near unto the river now called Thames, and named it Troynovant [New Troy] … ”. “ King Lud afterwards not only repaired this city, but also increased the same with fair buildings, towers and walls, and after his own named called it Caire-Lud … . This Lud had issue two sons, Androgeus and Theomantius, who being not of age to govern on their father’s death, their uncle Cassibelan [Cassivellaunus] took upon him the crown: about the eighth year of whose reign, Julius Caesar arrived in this land with a great power of Romans to conquer it [in 55-4BCE] … ”. Also in the sixteenth century, a statue of Lud was erected on the inner side of the city gate that had by then come to bear his name. 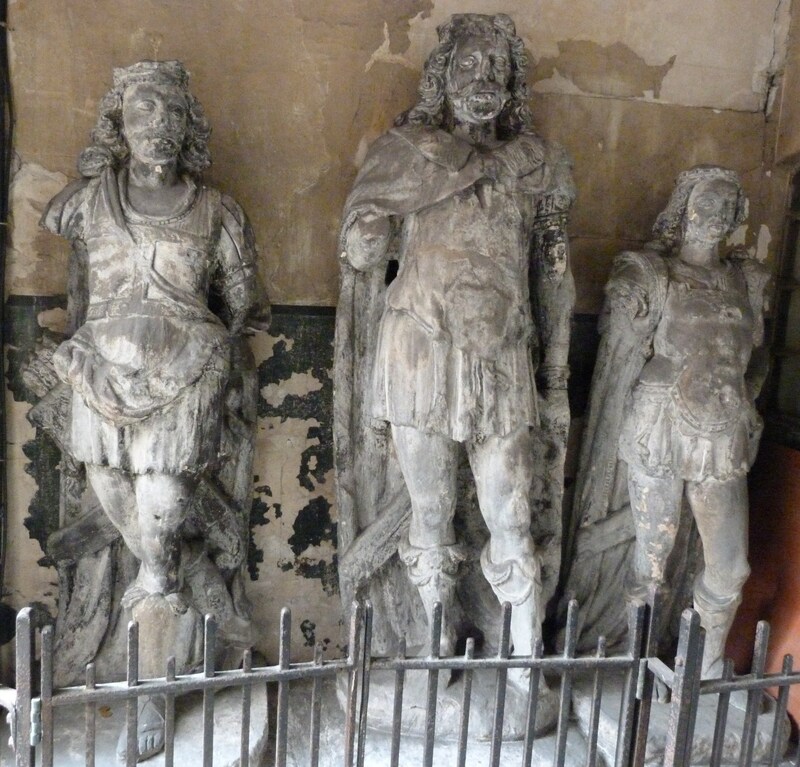 The statue was salvaged when the gate was later demolished, and may still be viewed in the church of St Dunstan in the West on Fleet Street. This entry was posted in London History and tagged Androgeus, Brutus of Troy, Caire-Lud, Geoffrey of Monmouth, John Stow, Julius Caesar, King Lud, Lud, Theomantius, Troynovant on December 11, 2017 by Bob Jones - The Lost City of London. This entry was posted in London History and tagged Androgeus, Brutus of Troy, Caire-Lud, Cassivellaunus, Geoffrey of Monmouth, John Stow, Julius Caesar, King Lud, Theomantius, Troynovant on December 11, 2017 by Bob Jones - The Lost City of London. London would appear to have been founded by the ancient Britons or Celts in the Bronze or Iron Age. According to the now sadly thoroughly discredited Geoffrey of Monmouth, quoted by John Stow, in his magisterial “Survay of London, written in the Year 1598”, it was founded under the reign of King Lud, sometime in the first century BCE, and at that time called “Caire Lud”, or Lud’s town (?or fort). When Lud died, his two sons Androgeus and Tenvantius, or Theomantius, as Stow put it, “ … being not of an age to govern … , their uncle Cassibelan [Cassivellaunus] took upon him the crown; about the eighth year of whose reign, Julius Caesar arrived in this land with a great power of Romans to conquer it … ”. The Roman invasion under Caesar, described in his “Gallic Wars”, was in 55-54BCE. Unfortunately, the only surviving structures from the Bronze or Iron Ages are some enigmatic pits and post-holes interpreted as representing the sites of former homesteads or farmsteads, in Leicester Square in the West End, near the Houses of Parliament in Westminster, and south of the Thames in Southwark (and the remains of a bridge at Vauxhall). There are no surviving structures or streets at all in the City of London, perhaps at least in part because, again as Stow put it, “ … the Britons call that a town … when they have fortified a cumbersome wood with a ditch and rampart … ”. This period of the city’s history remains shrouded in mist and mystery. Important archaeological finds from the Bronze or Iron Ages include (alongside more or less everyday items such as worked flints, pot-sherds, and coin, in potin, or tin-rich bronze, in bronze, in silver and in gold), much equipment associated with horses and chariots, a ceremonial horned helmet recovered from the Thames at Waterloo, and an ornate bronze shield recovered from the Thames at Battersea. It has been speculated that the last-named might have been offered as a plea to the gods of the river at the time of the Roman invasion. This entry was posted in London History, Prehistoric London, Roman London and tagged Bronze age, Geoffrey of Monmouth, Iron age, King Lud on February 22, 2014 by Bob Jones - The Lost City of London.